A week is closing with the Israeli continuous brutal invasion to everything Palestinian. I am not sure how a coincidence all this is . A vicious attack that targets with everything else Children and Universities. What is the common sense in terrorizing a whole nation for “maybe” kidnapped settlers? What do children have to do with this? Why do university campuses get targeted and invaded? If Israel is trying to terrorize us, there is nothing new in this. We are a nation under occupation of Israel safeguarded by the PA. What is it that Israel tries to achieve? Is it a new scheme for a new planned reality? I know that my conspiracy thinking theories prove themselves overwhelming sometimes, in reaching the closed circles of the present. But as my intuition is clinging, I am starting to also believe that the kidnapping story is not necessarily a real kidnapping by Palestinians. I would be happy to know that there is a chance to really make such a scheme that is so secure. After all, there is not much to search. If they were kidnapped, and an attempt to smuggle them anywhere beyond a couple of kilometers is literally impossible, there is a checkpoint and a barrier every few kilometers all over the country. The alleged kidnapping took place in the south; Israel knows well that it would be impossible to take them to the other side without being caught. Unless the kidnappers kidnapped themselves and are currently sunbathing on the shores of Eilat or somewhere else. The only place Israel doesn’t search in is Israel. The savagely attack on children through detention and killing, could be an attempt to satisfy Israeli public? 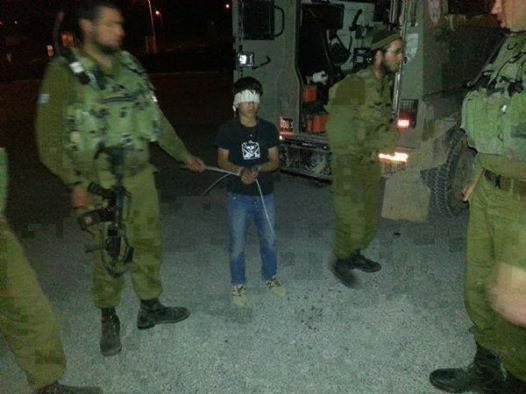 Is this a message to every Palestinian mother and father , “we will be kidnapping your children before your eyes” ? If the scenario of the kidnapping is true , it is a message to settlers , that you cannot be vaguely daring to settle on hilltops and be free to hitchhike . Where is your security matrix ? A message which is more important , in the mind of every Palestinian is the ongoing tragedy of prisoners. Not telling about the land stealing , slicing the land into what became a Swiss Cheese holes . Not mentioning as well, the dead negotiations that kept proving its infertility and persistence to injustice. What else did we Palestinian commit in this last month ? We were happy for the reconciliation that took place between the two rivaling fractions? Israel knows that we don’t believe it as much as they do . What seems to be a strictly internal affair among the Palestinians put Israeli government in a state of alert that only proves that Israel intends to keep the situation as is . What about the Palestinian Authority’s position . Mahmoud Abbas managed to put everyone in a state of awe ..His obviously un-strategized words once again hit the Palestinian public in the head . What does he think of ? What does he want us to do . To put the white flags and open our doors to Israelis ? this wouldn’t matter much to them either . At the end, what stands sadly sturdy is the fact that the Palestinian policed security system proved to us yet another time, the ring of security . When we are told that thirty percent of the PA budget goes to security , we understand now for sure that the security is the security we are witnessing today . When a Palestinian police \security suppresses a demonstration that supports prisoners’ hunger strike , and this same police open the way to the Israeli army to invade our homes and children … this only slaps us as a nation for an affirmed realization , that the peace that Abbas has been attempting to achieve for the last twenty years is the peace for Israel. Are we witnessing another form of ethnic cleansing operation that started in 1948? This time with the direct help of our own president? Nadia, you voiced a thought that passed through my mind. Although, I hadn’t thought of how difficult it would be for any Palestinian to smuggle out three Israeli boys.